What I especially appreciate about being a social worker is the opportunity to spend my career with colleagues who devote their professional lives to caring for people. What a gift it is to spend year after year collaborating with practitioners whose principal goal is helping those who are vulnerable and doing their best to cope with mental illness, addictions, loss, poverty, homelessness, aging, abuse, and many other daunting challenges. Many occupations—particularly those where profit and the proverbial bottom line are the end goals—do not offer that kind of priceless and profoundly meaningful collaboration. Over the years I have been moved deeply by social workers who extend themselves, going far above and beyond the call of their formal duties, to assist people who are living on the edge and who desperately need comfort and succor. This is what makes me proud to be a social worker, especially during National Social Work Month. The concept of altruism is central to social work's core values. According to the NASW Code of Ethics, "Social workers' primary goal is to help people in need and to address social problems. Social workers elevate service to others above self-interest. Social workers draw on their knowledge, values, and skills to help people in need and to address social problems. Social workers are encouraged to volunteer some portion of their professional skills with no expectation of significant financial return (pro bono service)." Altruism has a storied history. The word "altruism" (from the French, altruisme, from autrui, "other people," derived from Latin, "other") was coined by Auguste Comte, the 19th century French philosopher, in order to describe the ethical doctrine he espoused. Comte believed that people have a moral obligation to renounce self-interest and devote themselves to others. In addition to many philosophical treatises on the nature of altruism, the world's major religions clearly embrace the concept. In Buddhism, for example, people are encouraged to focus love and compassion on others, which in turn promotes happiness. In Islam, the concept 'īthār' (altruism) is the notion of preferring others to one's self. In Christianity, altruism is central to the teachings of Jesus found in the Gospel. Jainism preaches the view of Ahimsa, to live and let live and not harm sentient beings. Altruism is also central to Judaism. According to Hillel's famous maxim, "If I am not for myself, who will be? If I am only for myself, what am I? If not now, when then?" A core belief in Sikhism is that the greatest deed anyone can do is to live the godly qualities of love, affection, and sacrifice, among others. Mohandas Gandhi exemplified the traditional Hindu focus on altruism. Indeed, Ghandi was granted the title Mahatma (revered person or sage) in recognition of his remarkable efforts to help others. • A clinical social worker in independent practice provided counseling to a man who struggled with a chronic physical disability. The man lived alone and spent a great deal of time in his wheelchair. The social worker's clinical notes indicated that the client complained of being isolated and also had financial difficulties. Over a period of about six months, the social worker—whose clinical services did not include case management tasks—provided the client with several rides to doctors' appointments, occasionally went food shopping for the client, and once loaned the client rent money to help the client avoid impending eviction. Over time the client asked the social worker for an increasing number of favors. The social worker became uncomfortable with the growing boundary confusion and started to set limits. The client said that he was offended and filed a licensing board complaint. • A social worker employed by a mental health center provided clinical services to a woman who was diagnosed with depression. The client, who was not able to work because of her psychiatric condition, had difficulty surviving on her modest disability payments. The social worker felt bad for the client, who once had a thriving landscaping design business. In an effort to help the client earn some much-needed money, the social worker asked the client if she would like to earn some money designing and planting gardens for the social worker's new home. The client accepted the offer. About three weeks into the landscaping project, the social worker expressed her concern about the quality of the work. The social worker and client argued with each other and the social worker decided it was best to terminate the landscaping arrangement. The client became incensed and filed a licensing board complaint. • A clinical social worker in an independent group practice was approached by the practice's secretary. The secretary told the social worker that she was having a great deal of difficulty managing conflict in her relationship with her adolescent daughter. The secretary told the social worker that her daughter said she was willing to go to counseling with her mother, but under one condition: the counseling must be with this social worker. The adolescent, who struggled with anxiety, told her mother that she did not feel comfortable talking with a stranger. As a favor to her valued employee, the social worker agreed to counsel her secretary's daughter. During a counseling session that included the daughter and her mother, the daughter disclosed that she had been molested by her stepfather. The social worker contacted the local child protective services agency in order to comply with the mandatory reporting law. The agency investigated and found no evidence of the alleged molestation. Eventually the adolescent admitted that she made up the allegation in order to "get back at" her mother. The stepfather filed a licensing board complaint against the social worker for wrongful reporting. The licensing board sanctioned the social worker for counseling her employee's daughter, concluding that this violated ethical standards related to professional boundaries. Every social work instinct I have wants to encourage and celebrate altruism. Sadly, however, I have learned that, on occasion, my enthusiasm must be tempered by a realistic acknowledgement that unbridled altruism has the potential to produce toxic outcomes, even if rarely. Most acts of altruism by social workers, it seems, are only that: acts of compassion and generosity that brighten clients' lives. But in some cases, altruism that is motivated only by the best of intentions can harm clients and social workers, usually because of boundary-related confusion. Too often I have consulted on cases—some involving lawsuits filed by clients against social workers and some involving licensing board complaints—where former clients testified about how, over time, they began to perceive their generous social worker as a friend and that this ambiguity compromised the quality of the practitioner's work and harmed the clients. I have noticed several patterns among social workers' altruistic gestures toward clients that turned out to be problematic. In some instances, social workers perform favors for clients, for example, shopping for a homebound client, giving a car-less client a ride across town, or offering a homeless client a place to stay. In other instances social workers give clients a gift or share personal details about their lives in order to make a distraught client feel "special." 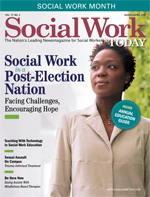 And then there are cases where social workers offer clients special opportunities—for example, inviting clients who are struggling financially opportunities to earn money by repairing the social worker's car, or when social workers arrange to be available outside of normal work hours "just in case" the client needs some extra assistance. Ordinarily, altruism is wonderful. That said, what I have learned during my career is that social workers should draw on that time-honored social work concept of "use of self" whenever they consider acting on their altruistic instincts. What are my motives? What are the possible repercussions of my altruistic actions? Is there any possibility my client might be harmed or my career jeopardized? Finally, ask the Latin question: "Cui bono?" Translation: For whose benefit?